"Thank you for visiting my blog, please come back soon." January is going really well. Well pleased with 2015 so far with two new finishes this week. 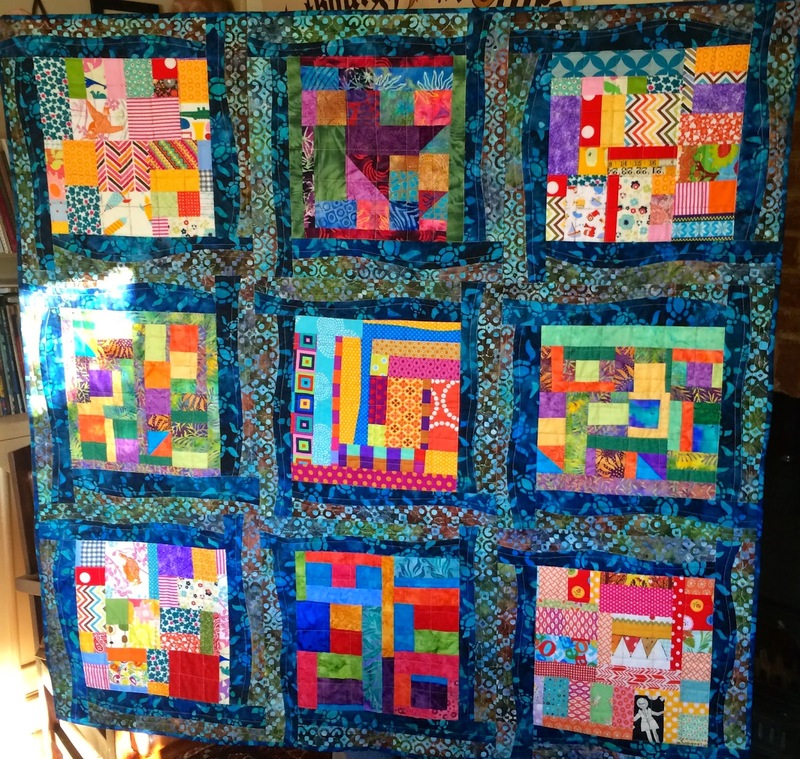 My first Charity Quilt of the year, this one is for Siblings Together 2. 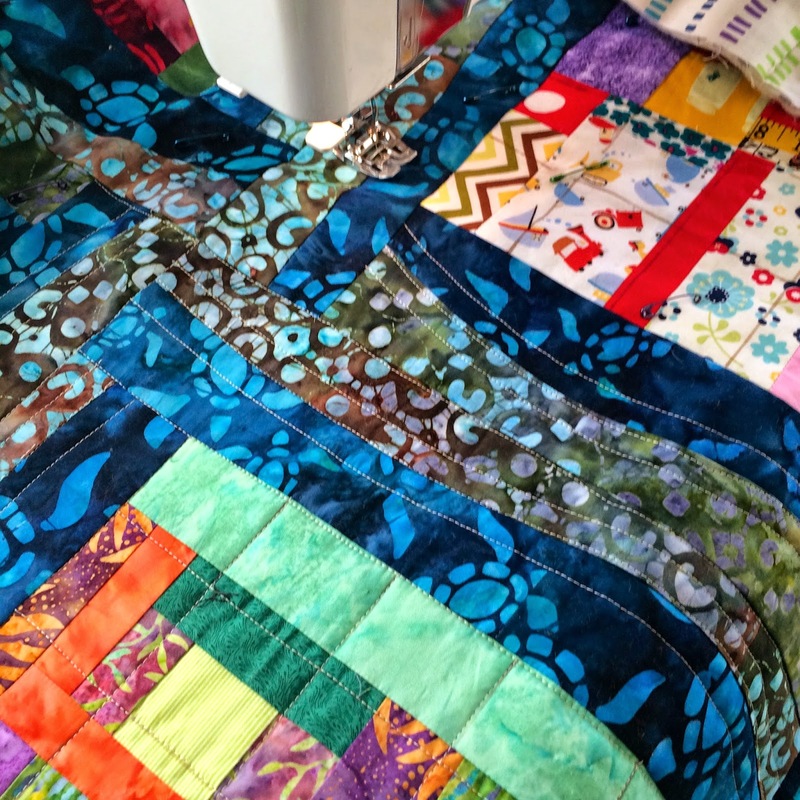 I hope to make two quilts for them this year, this one is finished and quilted with just the label to do. The blocks were very large and so it went together very quickly. The second one needs to be sandwiched with wadding /batting and backing. 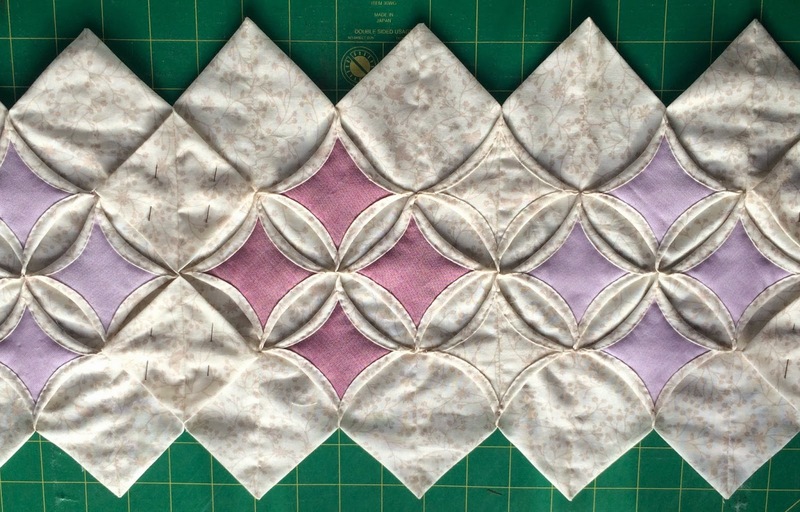 The blocks were quilted in a grid and the sashing was quilted following the curves. 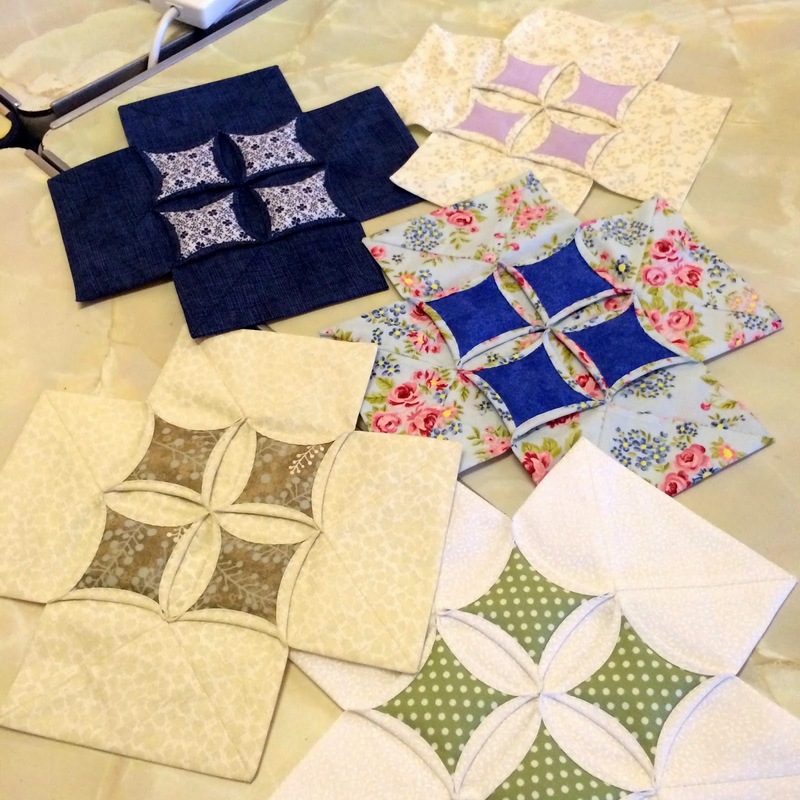 Well pleased and thank you to the girls in our group who sent such lovely bright blocks made from their scraps. 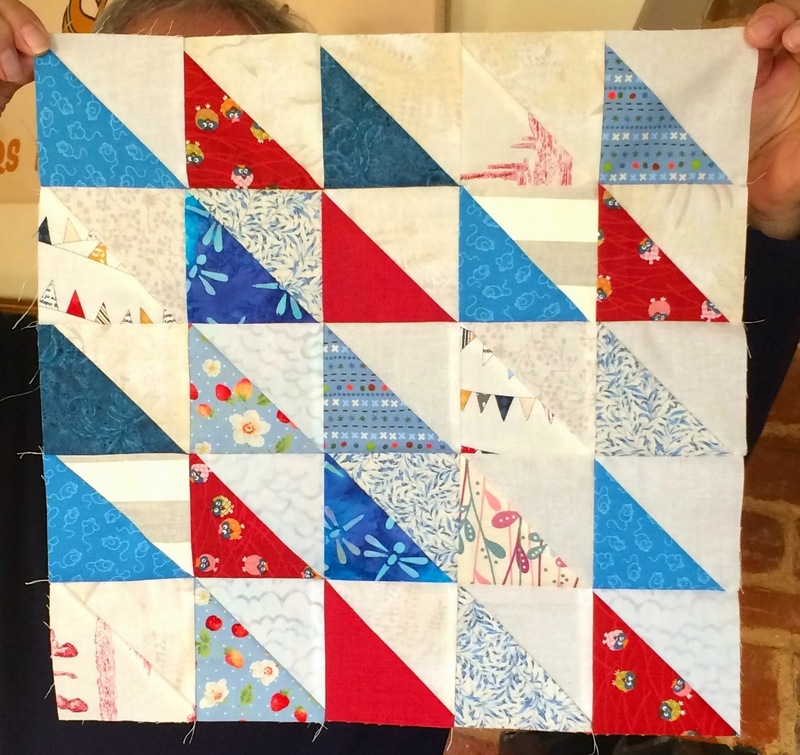 Quilting done on my home machine. This charity is very dear to me as I was parted from my siblings when I was very young. I do wish that this had been going on when I was young. 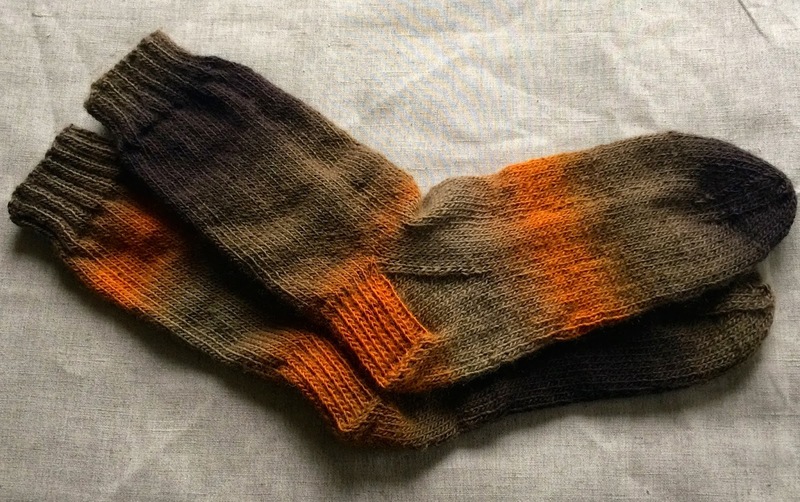 The other finish is the first pair of socks for the year, only 11 more pairs to go. Not pushing myself this year at one pair a month it should keep the family happy. It is indeed my first finish for 2015. 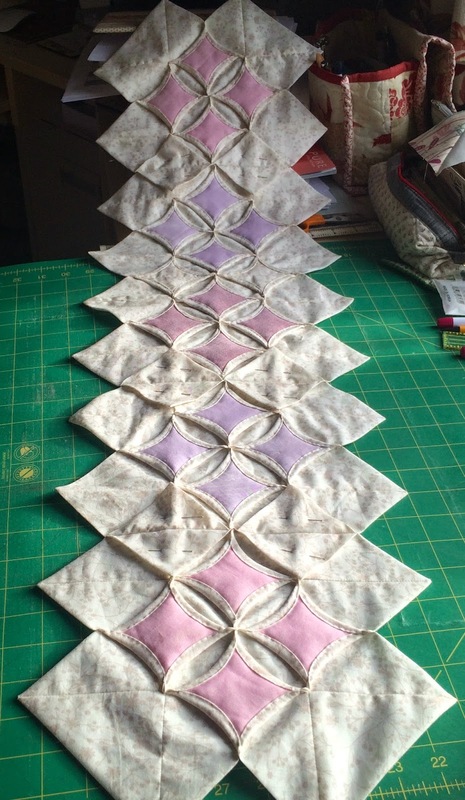 I turned the new ways with Cathedral Windows blocks into a wall hanging, though it could still be a table runner. Very pleased as I used up some of the fabric left from my appliqué quilt, which I am still hand quilting, but getting there slowly. 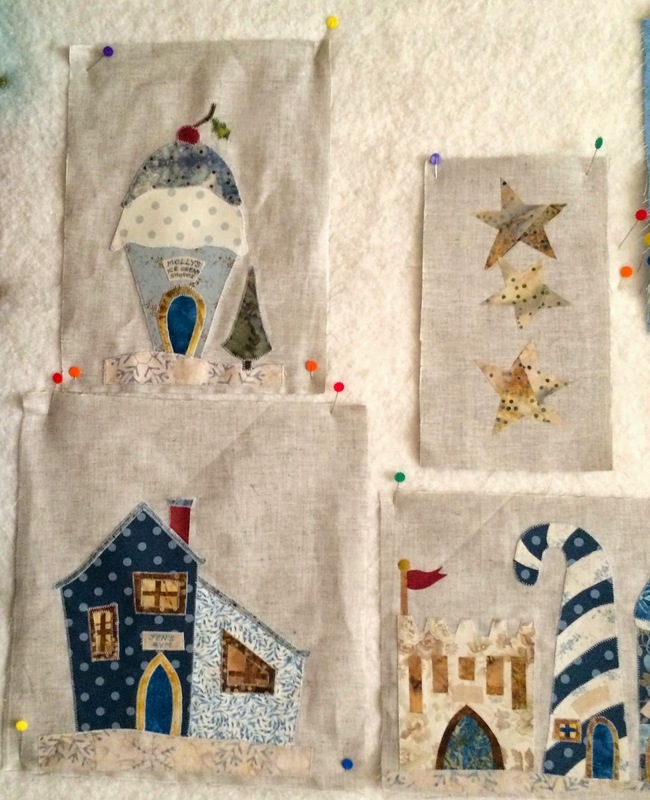 Some progress has been made on the "Welcome to the North Pole Quilt", it does feel odd making a Christmas quilt just after Christmas, but hopefully it will be finished by next Christmas. Jen's Gym was finished yesterday along with Molly's Ice cream shoppe, the stars and the Candy Cane factory need finishing. Things are progressing on the decorating front, and the spring cleaning should be finished by this week end. Then the holiday cottage will be all ready for the first guests of 2015. New Cathedral Window blocks, although one of the girls had gone home by the time I took this photo. They are such fun to make, and all so different. Mine is however, getting rather long. It's 38" without a border so it's about the size needed to fit our little dining room table. Mr M and I are getting our holiday cottage which we rent out, ready for the season. So sewing will be relegated to the evenings for the next week or so while we do lots of painting etc..
Where, oh where have the first 10 days of the New Year gone? The first meeting of the Bees was on Wednesday, so here is a little round up of what was going on. Maggie had brought in her pieced top and wanted some help on how to quilt it. 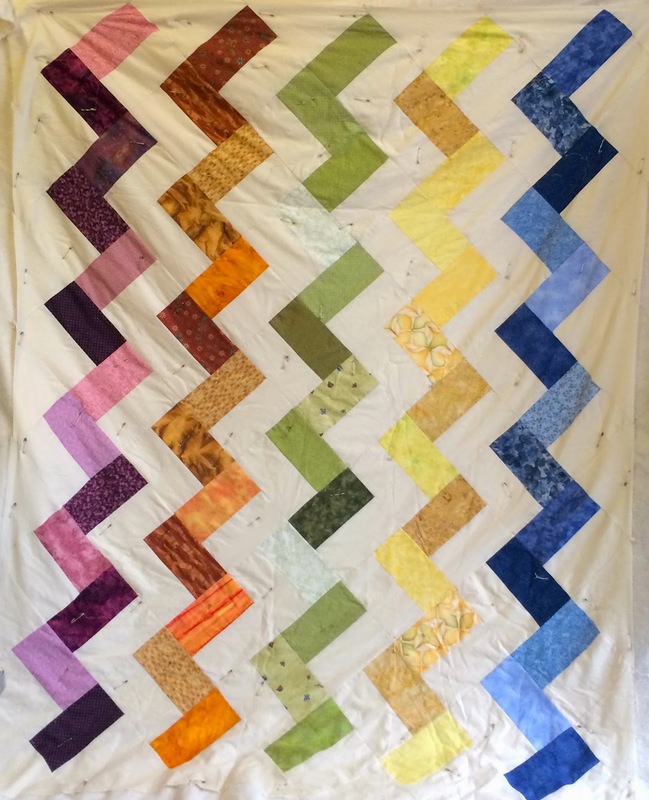 We all decided that some straight line quilting following the zig zags would be the way to go. 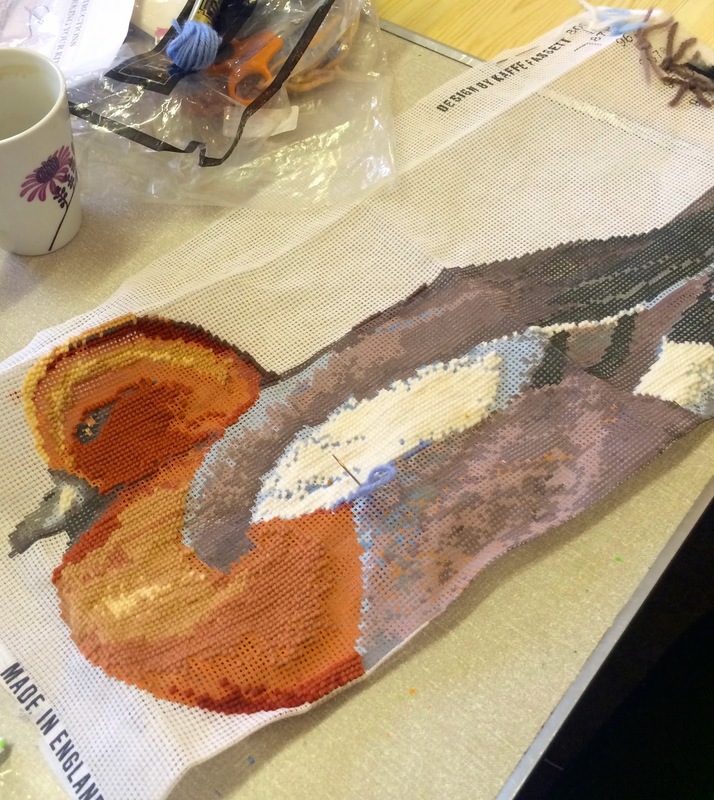 Fiona was doing her tapestry, I am not sure if it's going to be a cushion or a fire screen. It is really lovely. 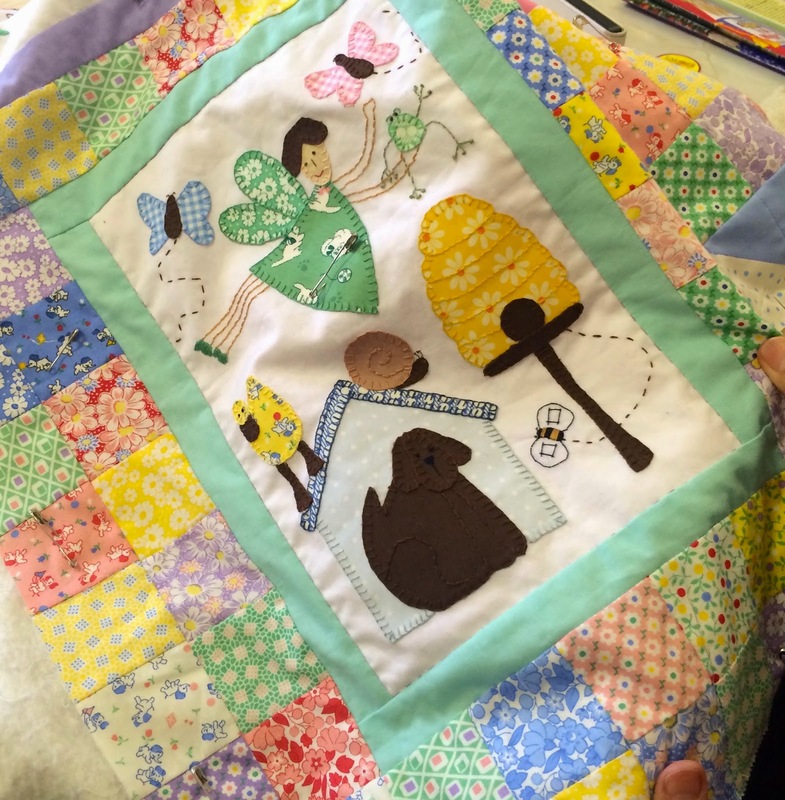 The lovely Sue was hand quilting her fairy quilt, her grand daughter is going to love this one. And Jenny was frogging her granddaughters cardigan again. 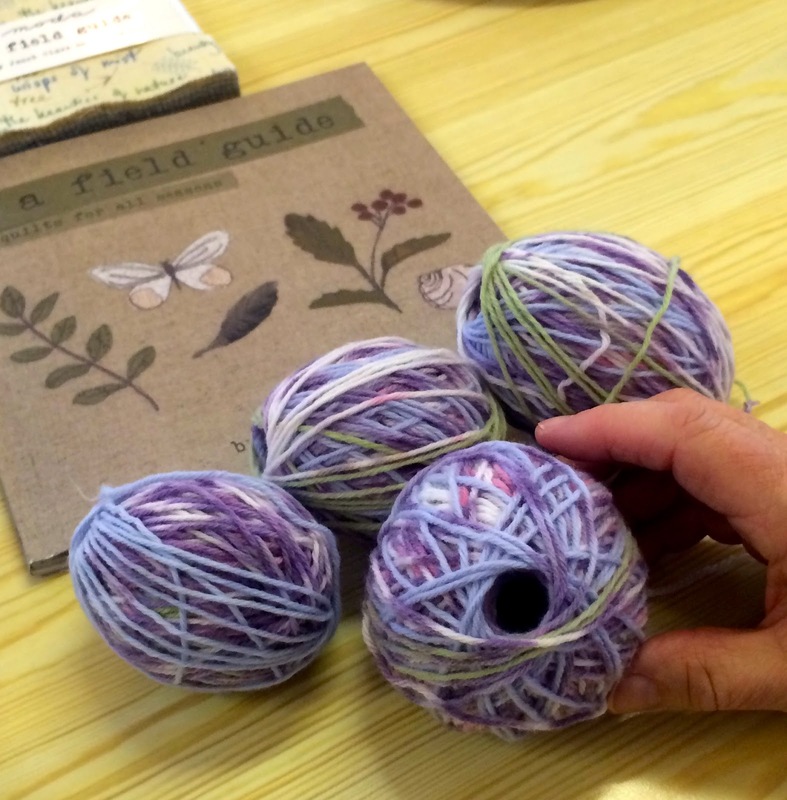 Now we all thought it was great how she winds up her wool, they look like little pods, so some time was spent teaching us all how to do it. Me, well you can guess exactly what I was doing.Yep, I am still hand quilting my appliqué quilt.Well, the middle section has just one block left to do. Then it is on with the border, so I am getting there. I also have done the Block for ST2. I am pleased Sue who was the Mama of the month had chosen an easy block to start us off. Now this is a warning, if you have a bottle like this in your wine rack look after it. Just before the New Year all of our children descended en masse, and during the meal it was noticed our bottle was leaking. 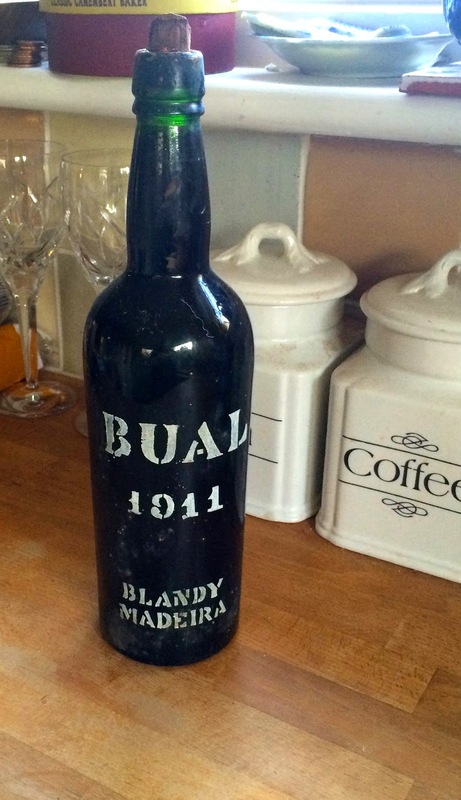 It was duly opened and decanted, and it was delicious!!!!! I have been married for 54 years, We have 3 grown up children all married 4 grand children, and one Great Grandchild. 2 dogs a Border Terrier and a Deer Hound. 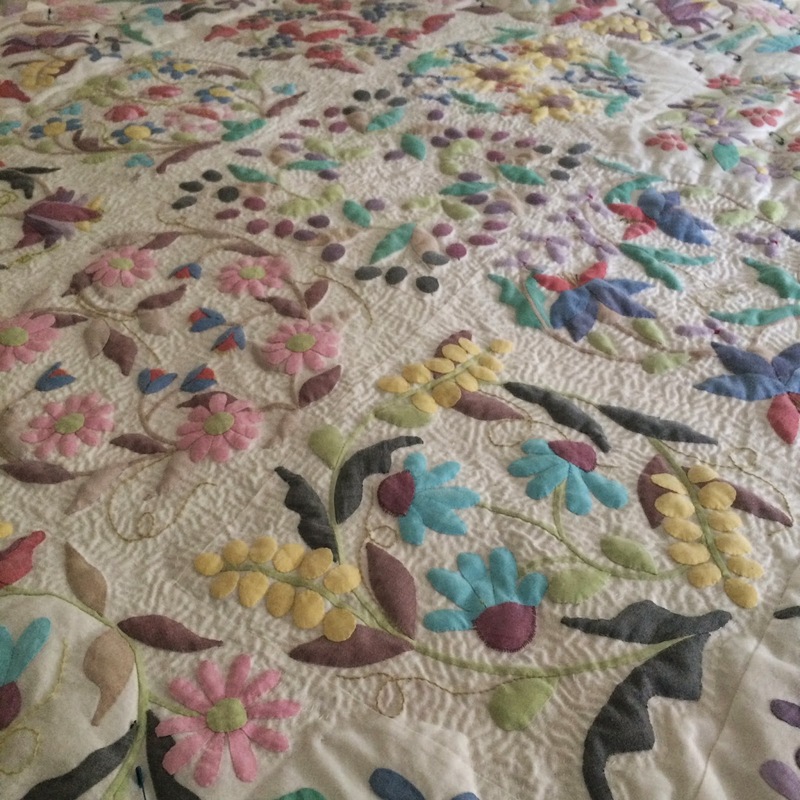 I am a retired Potter / Art teacher and now spend most of my time Quilting and Designing my own patterns for Stitchery and Appliqué . The contents of this blog is the property of Elfin Patch, and is covered by copyright. Watermark theme. Powered by Blogger.